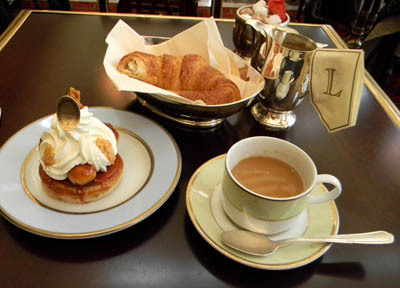 An iconic French pastry—and one I always order multiple times when I visit Paris—is the Saint Honore, a decadent dessert made of puff pastry, pate a choux (cream-puff dough), creme chiboust (a thick pastry cream made with stiffened egg whites) and creme Chantilly (the French term for whipped cream). Named after the patron saint of patissiers (Saint Honore, the former bishop of Amiens, France, who died in the year 600), this stacked pastry is made in layers—first a puff pastry base is baked to crispness; then a small pyramid of tiny cream puffs are placed atop the base; next, the spaces between the tiny puff pastries are filled with chiboust cream; and finally a peak of freshly made whipped cream is piped on top. The classic Saint Honore (sometimes called a “caramel” version) is made with the above ingredients and a coating of caramelized sugar on the tiny cream puffs. Flavored Saint Honore pastries typically are made with flavor-infused creme chiboust, and usually colored and flavored icing or jam is spread on the cream puffs. They also often include fresh berries (particularly raspberries or tiny strawberries) or nuts (usually pistachios). 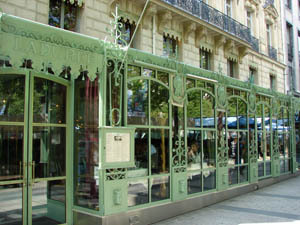 Most Parisian bakeries create at least one of the seven most popular versions of the Saint Honore: classic/caramel, rose-raspberry; chocolate; vanilla-chocolate; pistachio; chocolate-strawberry; or pistachio-sour cherry. 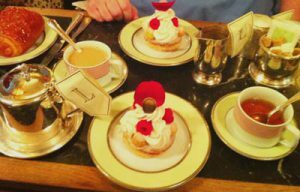 My favorite spot to indulge is the famous patisserie and tea room Laduree (specifically the Champs Elysees location, but the Rue de Castiglione tea room will do in a pinch). There’s something about Laduree’s formally dressed waiters, the silver serving trays, crisp napkins, and the elegant surroundings that make exquisite Saint Honore pastries even more delicious! 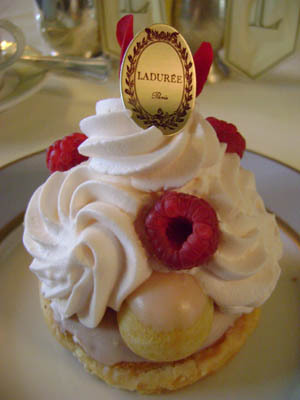 This entry was posted in Famous Paris destinations, Food, French cuisine, Patisseries and tagged Champs Elysees, Laduree, Saint Honore pastry by Bob Adams. Bookmark the permalink.